Hello and Happy Monday, everyone! 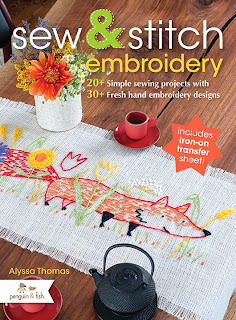 I'm checking in today to support my friend Alyssa Thomas and the release of her great new book, Sew & Stitch Embroidery. 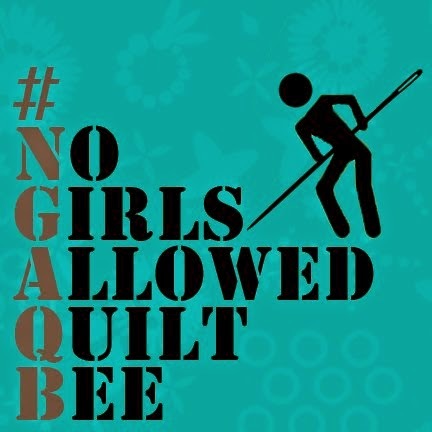 Yes, I think it will be my sewing friends and their continued successes that might ultimately draw me out of this somewhat unwanted but self-imposed leave of absence from blogging. I just can't help but share in the excitement of good news and good products from really good people. And Alyssa is most definitely one of those people. I first "met" Alyssa online a few years back when I began experimenting with and teaching myself some embroidery skills. I was immediately drawn to the overall vibe of her artwork -- simple and accessible, chock full of character, and just SO DARN CUTE. I was also lucky enough to participate in a few embroidery swaps with her and visit her very first quilt market booth! 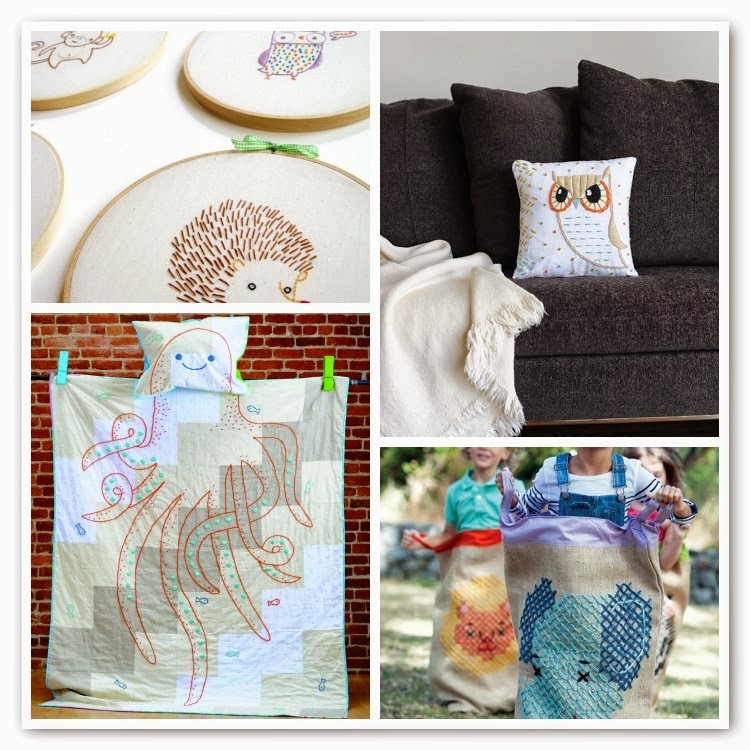 Her embroidery designs are perfect for new & experienced stitchers alike -- relatively simple to complete but the end results are sure to impress. 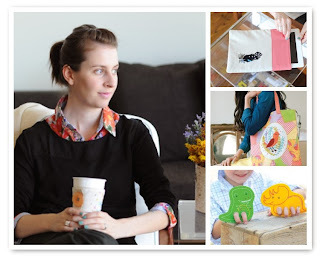 Since then, I've been delighted to follow Alyssa's journey in building up her embroidery-based business, Penguin & Fish -- great freebies over there, by the way -- as well as her forays into fabric design and book publishing. Here's an original design that Alyssa first drew and stitched for me as part of a swap piece, the pattern for which she is now including in the book! If you find yourself even remotely drawn to Alyssa's work, you'll absolutely love Sew & Stitch Embroidery. In this book, Alyssa infuses her embroidered characters into over 20 different sewing projects, from pillowcases and table runners to toys, scarves, and tablet sleeves. Along the way, Alyssa includes 30+ embroidery patterns that can be used in the book's projects and beyond. With 20 sewing patterns and 30 embroidery patterns, this book earns an A+ in value. You can buy your very own copy of the book on the Penguin & Fish site here. When you buy directly from Alyssa she'll not only sign the book, but draw you a little doodle inside. Take it from me and my own experience: receiving a package from Alyssa is always a delight, since she tends to doodle on everything! With the holidays rapidly approaching, Sew & Stitch Embroidery gets the Quilt Dad seal of approval as a great gift idea for the crafters (and wannabe embroiderers) on your list. And as the father of 3 young children, I can vouch for the fact that Alyssa's designs are PERFECT for the creative kids in your life. 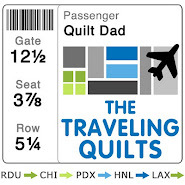 I'm also giving a copy of the book away to a lucky Quilt Dad reader! Simply leave a comment on this post and tell me a little more about your experience with hand embroidery. Are you a new stitcher? More experienced? What is the favorite project that you've made? I'll randomly select a winner from all of the comments later this week. Be sure to keep in touch with Alyssa and everything Penguin & Fish via social media!